I have an immediate need for exactly this solution. I was asked to chart statistics from our help desk to reflect the abandoned calls versus the total calls. I’ve been struggling with this for a bit to see if I could get it to work. Thanks you so much for the informative posts, they have helped me countless times. I do however, have a question that I’m struggling to find a straight answer to on the net. That is, I want to know how to improve the speed of VBA scripts which are creating and using many charts with many data series. Being an engineer, I like to push things to the limit so I went bananas with producing many charts from large data sets produced from batch studies. This code works perfectly, however, I find it to be a bit slow for my liking. I also find that it gets slower the longer it runs. Assuming that this was a memory leak issue, I decided to watch the performance monitor whilst running the script and saw that the memory usage of Excel steadily increases. I tried to clean this up a bit by setting unused objects to nothing but the problem is still there. Is the lack of speed perhaps due to the chart being activated when it is created, is there a way to deactivate it and add series and formatting without using the ActiveChart command? Sorry this comment isn’t really related to this particular post but I couldn’t work out how else to ask you. If you do have an answer, a post on improving speed whilst working with charts in VBA would be much appreciated. right before you exit the sub. You might like to read my piece on Fixing a Recorded Macro, which covers a number of other ways to improve recorded code. where do i click Draw Left to Right Axis? 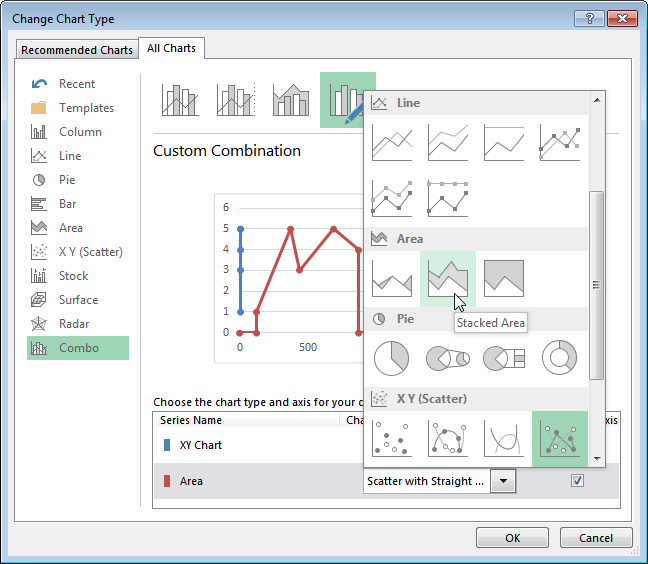 Excel 2007 and 2010: Chart Tools > Layout tab > Axes dropdown. 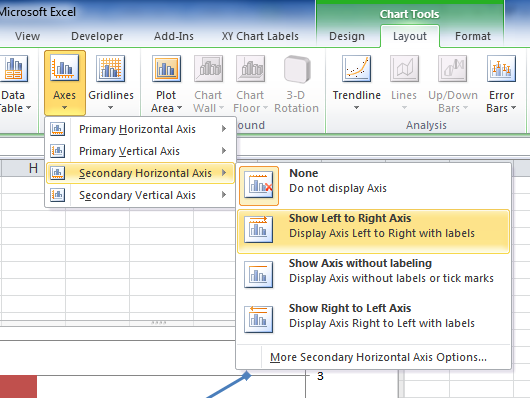 Excel 2013: Click the plus icon next to the chart and click on Axes. Thanks Jon for the useful post. I could create a chart I was looking for with the method you provided above!! Is it fine up to that point, or is it not really following the example? I got the example to work and I’m trying to apply it to new data on a log-log scale (y = 1E-05 to 1E-01 and x = 1 to 1000). I managed to get so far by basing the area chart on the log of the xy base data. However when get to the step where I delete the secondary x and y axis it can’t seem to cope. I ended up getting something by colouring the secondary axes white, setting the chart background blue and setting the 1st series area (above the xy line) white. Not elegant but just about gave me what I needed! Would be interesting if there is a better way to do this as I’m often plotting log-log charts. I am trying to do something similar to the “Blank” Example above. I have two sets of data; receipts per month and completions per month, and would like to highlight the areas between each. I’m not sure if the overlap in the data (see below) plays a factor, but would appreciate any assistance. I kept going through your tutorial and have gotten everything to plot, but for some reason it won’t align correctly. I’m not sure if it has something to do with the formula used in column E of your tutorial or not. Here is a link of what is happening. I’ve recreated the chart, using my protocol and your data, and I found the problem. Fix the last three X values. The last one should be 1000, and the two before should be 857.1 (that is, 6/7 of 1000). Also, get rid of the 0 and 7 at the bottom of the first column, to avoid confusion. I managed to copy tutorial you made for filling between chart. Anyway, is there anyway to control the order of the chart animation when we use it on excel, because on the example made, the order comes where the fill between chart come in first before the chart it self. 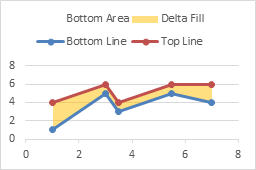 The aim is to animate the low and down chart first, and then the fill comes next. I think PowerPoint just animates in stacking order of the chart series. If so, the fill appears first, then the lines. I’d first like to thank you for the helpful advice you’ve provided thus far. 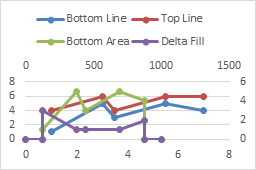 I have a question regarding how to plot the area under the curve for a normal-log chart (so say, a y-axis going from 0 to 100, and an x-axis going form 1 to 100,000). I’ve tried the method you’ve described here, and it doesn’t seem to line up with the log scale very well. I’ve also tried integrating the functions for the values described and plotting that, but that didn’t work, either. Any advice or help on this matter would be appreciated. You will need to use a two-step transformation of the X axis values. You start with 1 to 100,000. First you take the logs of these, so you have 0 to 5. Second you have to spread this out on a date axis with sufficient resolution, to get from 0 to 1000. The X axis that has the XY series should be converted to a log scale, but the date axis for the area series is a linear axis based on the logs of the values it is based on. Looks like your formulas are using 10^5 instead of 10^6 for the maximum. 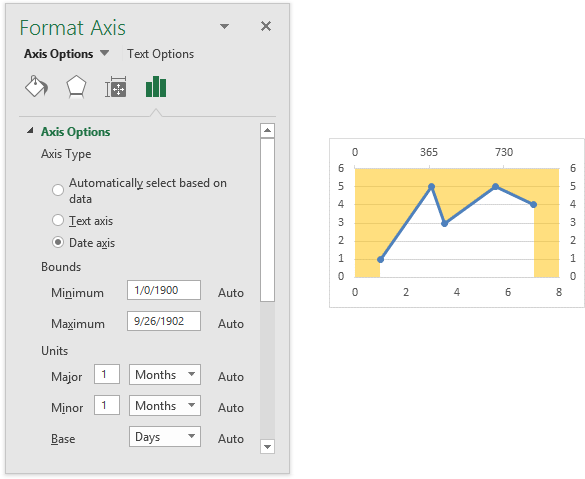 Similar to one of the questions already asked, I don’t see “draw left to right” for the secondary horizontal axis in the dropdown in Excel 2010. Instead the dropdown includes: show axis in thousands, show axis in millions, etc. What do I need to do to see that drop down? 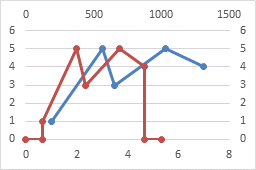 Change the chart type of the blue line from line chart to XY scatter. Great instructions. 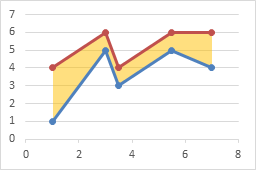 I have an Excel 2010 line chart with both year and quarter labelled on the X axis. I want to shade between the lines to the right of the green dashed line, i.e. between the purple and orange line and also between the purple and blue line. That can certainly be done, following exactly the protocol in this tutorial. Is there a way to make the area fill color change when it passes a certain threshold. To make it turn red as it surpasses 5% and green when it goes below. in my excel sheet after i applied ur way to draw a filled moment diagram! with a execl chart ,but the excel keep “crash” when i click on it! What version of Excel? How complicated is the chart (how many series, etc.)? I have a simple graph showing Hours Variation from Target. The Target is always 0, so it’s a horizontal line in the middle of the plotting area. 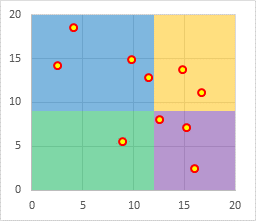 The Hours Variation points are plotted above target (positive numbers) and below target (negative numbers) to show late or early submission of reports. Using Target as a reference/baseline, I’d like to shade the area between Target and any points above Target in red (they are late submitting), and the area between Target and any points below Target in green (they have submitted early). An Area Chart looks like exactly what I need – I just need to be able to change colour based on position above or below the zero line. I’m running Access 2007 btw. I don’t know about Access… But for an Excel area chart, try Area Chart – Invert if Negative. Thanks so much for your help! I’m onto it already. Hi, thanks for the information above, however I am really struggling getting it to work for my purpose! Basically I have a plot which has depth on the y axis and strength on the x axis. with depth the strength generally increases however we add a factor to the original data which gives us our 2 series. The example above is great for if you want the shading focussing in the x axis direction. how do I get it to focus ion the y direction? I’m in a new job and really could do with impressing my boss so would be really grateful if someone could help. if you need anymore information please email me and I can send a screen shot to help explain. About the ‘Fill Under One XY Series’, I am really struggeling to manage a range that contains negatvie values i.e. (min =-120 | max =120). Can one provide an example please? The routine actually doesn’t “fill under” a series, it fills between the series and the horizontal axis. You would need to use the approach like that for filling between two series, and the lower filled area (the one that is made totally transaparent) would be a horizontal line across the bottom (most negative value) of the chart. thanks Jon. I am somewhat stucked with this. Could you help me with the right outer part please? Here are the steps to building the chart (click to open a full-size view). I’m facing nearly the same problem : x-axis goes from -6 up to +6 under a standardized normal distribution. Everything works fine until the point when the chart-type is changed to a stacked area. My 2nd horizontal axis when changed to date-type starts with zero and it is impossible for me to align the curves properly. If could give some advice I’d be grateful for that. Make sure the calculations of the scaling of the X axis has been done properly (column E in my example). Hi Jon, thanks a lot for helping me out in details. One last question, if I want to start the chart plotting at ‘0’; what would I need to do ? You mean at X=0? Start the data at X=0 instead of X=1. You have a data sample to help me see what you need? As near as I can figure, this doesn’t work if the initial series you want to shade under is constructed so that it is rectangular. I did this by creating the vertical and horizontal faces of the rectangles, basically so that an XY looks like a bar chart. This is the primary series I want to shade under. The thing is, there is no equivalent for the shaded series. The 2-d area chart you recommend does not literally “connect the dots”. Instead, the connections are interpolations that are all at angles. So, the shading does not match the line. That original chart is pretty bogus. The year axis isn’t drawn proportionally, so it’s not as much of a timeline that it appears. The spacing between years is not proportional, so I don’t know what to make of the widths of the bars. In any case, the shape of the XY series should have no bearing on this technique, as long as it doesn’t ever move backwards. Could you post your data so I can look at it? I followed the link to the NBER trough/peak data. I must not be thinking clearly tonight, because I can’t visualize how they turned a table of months and years into a square timeline. There are two figures. The top figure was published in The Wall Street Journal on Friday. Yes, it is bogus (but not for the reasons you cite). The width of the bars appears accurate. The widths between the bars are not accurate. The labels along the horizontal axis are “accurate”, but are for the left side of each bar. The bottom one is my version. There’s includes only expansions. Mine includes both expansions and recessions/contractions. The widths, heights, and areas above or below the 0% axis are correct in my diagram. But I can’t figure out how to shade them. There is some spreadsheet work involved in the background that I won’t bore you with. The data that is appropriate for my chart (the second one) is pasted below. Connect the dots, and you get my chart. Convert the fractional years to dates (e.g., 1953.375 = 5/16/1953). Now you don’t have to fuss with converting axes, etc. If you want to show up and down areas in different colors, use a formula to put MAX(value,zero) in one column and MIN(value,zero) in the next. At this point you just have to copy the data in D:F and insert an area chart. The date axis is used automatically, you just need to apply some formatting. And I doubt you need the line, but if you do, it’s probably easier to make a line chart with column D as the X values and the original data in column B for the Y values. Thank you very much. I will digest this on Monday. FWIW: The dates are in a format I prefer for the purposes of the chart (and the underlying raw data). Digested. Yes, this works. I will credit you, as is appropriate. FWIW: I want the dates in that particular format generally … but I’ll make an exception for such a slick method. I didn’t realize that I wasn’t thinking outside the box when I chose an XY chart in the first place. It’s probably a mismatch between the primary and secondary horizontal axes. The reason to use the complicated approach here is that area charts use a line chart’s axis, which by default does not show X values proportionally, doesn’t consider fractional numbers, and also doesn’t allow for an area with a vertical edge. We convert the axis to date scale so we can show points at irregular horizontal intervals and also show vertical area edges. Since your data is equally spaced whole numbers, we can make the chart much more easily. First, you can use a line chart for the original values. Convert the axis to a date-scale, to get the vertical edge. 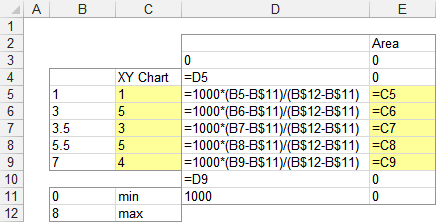 Use the year values as the X values for all four series. There is no need to use both primary and secondary axes. Prepare the data by inserting a row before 1983, repeat 1983 in the first column, leave the next two cells blank, and put zero into the last two cells. Add a row at the end, repeat 2013, leave the next two cells blank, and make the last two cells zero. Plot all four series as a line chart. Convert the last two series into area type, and format the lower series with No Fill (I just made it transparent below, so you can still see it). 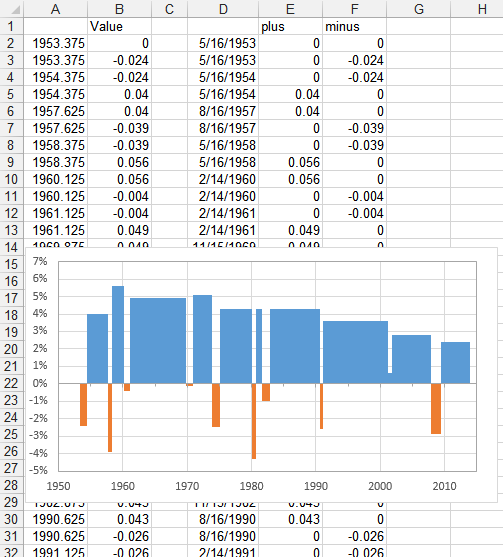 Convert the axis to date scale, set the minimum to 1980 by entering 6/2/1905 in the box, and the maximum to 2015 by entering 7/7/2015 (just type the years into a cell, and format as a date). Use 5 for the major tick spacing. That fixed it. Thanks, Jon! I really appreciate the help. First, I have used your earlier post – Histograms Using Excel XY Charts – to be able to make a dynamic histogram which excludes #N/A. The reason is because I want to be able to change the data inputs, which allows the histogram to automatically fit the lowest and highest x-values in the sample used. Second, I have now tried to fill the “bars” (below the XY-chart) using this post. If I let the primary x-axis’ MIN and MAX be set automatically, the Stacked Area chart (on the secondary x-axis, using the date format) will mismatch the XY-scatter perfectly. Using manually MIN and MAX on the primary x-axis (sat equal to MIN and MAX from the calculations in this post), I am able to match the two series, but then the histogram is not dynamic as i would like it to be. Do you know if there is a way to make the histogram dynamic? How can the MIN and MAX functions in your example return 0 and 8 while they are obviously 1 and 7? Can you show the formulas you used there? No formulas. 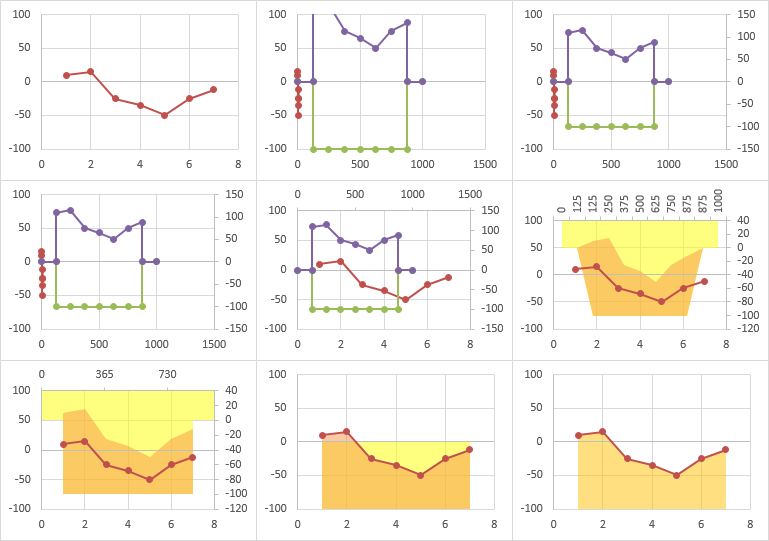 Those are values I typed into the cells, based on how Excel plots the XY data. I’ve tried to clarify this in the text. I simply create two sets of data, in the same order as above, but the result is not correct. 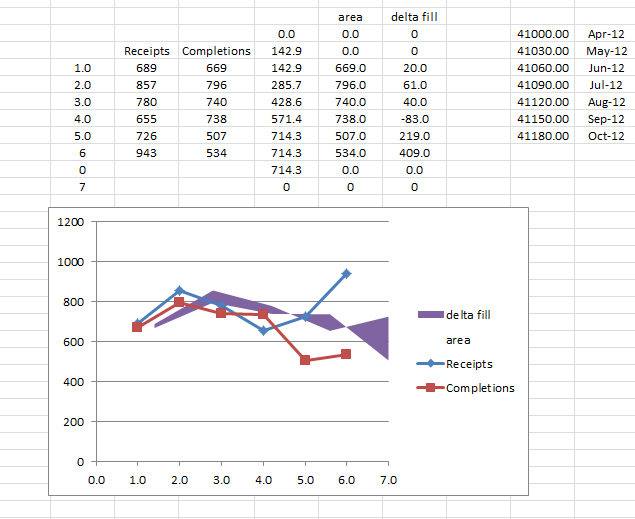 It seems that excel chooses two different secondary axes for the two sets, which messes things up. 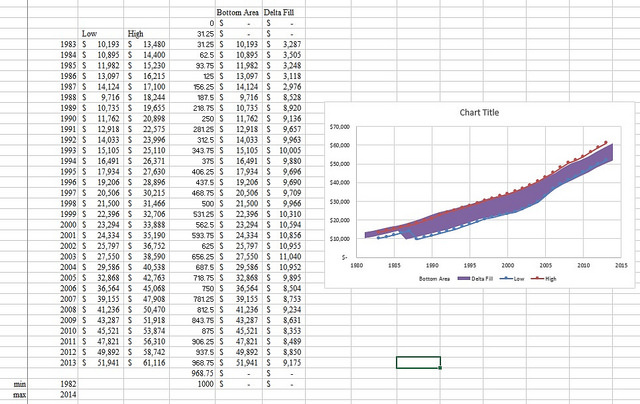 When I remove all data from one of the series from the chart, it looks fine again. Is it possible to solve? Looks great, but I messed it up. Is there a complete demo-file to download? Perhaps i’m missing the obvious, but how could I get it to work with dates on the X axis? I have monthly data that I would like to use this idea for. ok, I WAS missing the obvious, I just had to change it to Stacked Area rather than just Area Chart!! I need to highlight a range within a chart to show whether the data points fall within, above or below average. I can’t seem to figure out how to make this work. PLEASE HELP! I’m having the same issue as Adam Barnard on 1/22/14. I’m working with depth profiles and am having a hard time with the fill area in the horizontal direction. 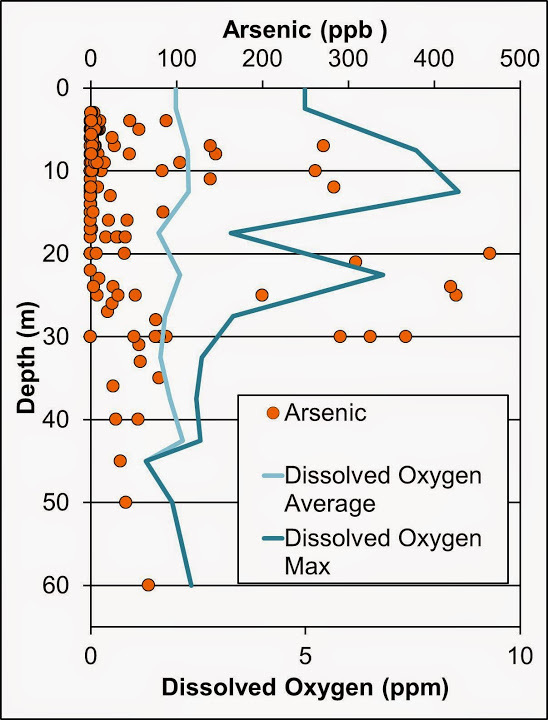 I’ve got depth from 0-60 meters and dissolved oxygen values from 0-10 ppm on the x-axis. Any suggestions? Check out Excel Charts With Horizontal Bands. I think the photo will help describe what I’m needing help with. Keep in mind how area charts fill in areas. They fill from a lower point to an upper point. If a second area intrudes between these two points of a first area, the first area can’t fill partway, stop when the second area intrudes, then continue above. This means that you’ll have to fill the areas piecemeal, which I have partly done below (it’s slow and tedious). Even if all you wanted was to fill between the two lines, you still need all of these areas, just many of them will be transparent. Hello, i appreciate your work, it helped me a lot with presenting my data. I am a PhD student in agriculture, and for my needs, have to combine a chart like those in this tutorial, i made it to present climate data and construct a Walter-Lieth climate diagram which is not possible with the base chart types in excel. after making it, i used your tutorial for a gnitt chart to make a feeding timetable for animals. Is there any possibility to combine these two charts so that the major vertical grid lines overlap? The gnitt chart has to be attached at the bottom of the XY chart? If further feedback on this is needed i can send a link with both of my charts. I am interesseted in visualizing climate-data too. how can I get in touch with you ? You can mail me to sedic.elmir@hotmail.com or e.sedic@univpm.it for further communication. That was an interesting problem to track down! What about shading in between two vertical lines? i.e. two quartiles on a chart. Its possible, just as shown by Alicea, its just important to set the limits of your background fill and the highlighted area. Thanks Jon, great stuff….owe you a lobster dinner!! Thanks for the great post. I am running into the same problem as Tim Hoy did, I cannot get my two graphs to align. Here is a link to the chart. Is my problem that my origin is zero? What can be done to fix the vertical axis if most of the data is quite close together say between the range of 1500-2000. 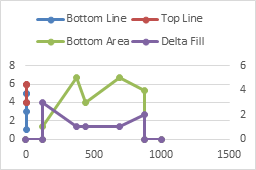 All my data is pushed to the top area of the chart with the first stacked area series (the transparent one) taking up most of the chart. When I try to reset the axis it reverts back to initiating the scale from 0 automatically. Its possible, the same way you paint one space between lines, you can do it with the second space. I did it for climate diagrams, even with intersecting lines, and with three colored spaces. Jon, thank you for this post!! But I want to follow up on the question that Jos wrote some time ago, about the Xmin and Xmax in your example being 1 and 7 and not 0 and 8. It’s the “based on” that looses me. I replicated your example and tried different values that seems just as valid as your 0 and 8, like 0.5 and 7.5 for instance. Well, for any other values than 0 and 8, the area misaligns. I tried on my own XY scatter curve with 200 different values of x. There again I had to manually try and find an Xmax so that the area would align properly. After n attempts I got i t kinda ok, but I must say that this Xmax was not found “based on” the scale or anything else.. So, I’m sorry if I’m kind of redundant here, but how do you figure out Xmin and Xmax ??! Thanks for your time, that would be super helpful!! The Xmin and Xmax of my data were 1 and 7. The Xmin and Xmax of the axis that Excel drew for me were 0 and 8. I’ve rewritten the description to try and clarify what I meant. Ohh I get it now!! and thanks to your (just as great) page about bound calculation (https://peltiertech.com/how-excel-calculates-automatic-chart-axis-limits/) I’m out of the woods!!! Thank you VERY much!! 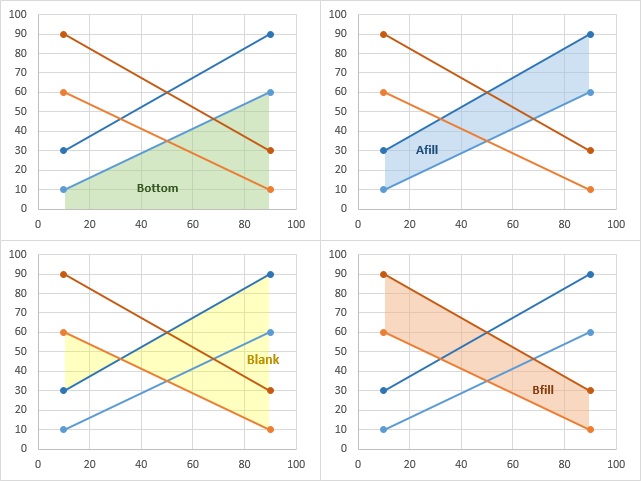 Hey mate…thanks for the tutorial….I’m trying to do something a lil bit different….I have multiple “top” and “bottom” series, and I wanted to fill the areas between those series….is it possible to have multiple series (for different values in the x-axis, series never cross each other)? Use a blank formatted series for the area below the lowest “Bottom” series. Use a filled formatted series for the area between this and the lowest “Top” series. So far it’s just like the example in this article. Then use a blank formatted series for the space between the first “Top” series and the second “Bottom”, and a filled series for the space between the second “Bottom” and the second “Top”. 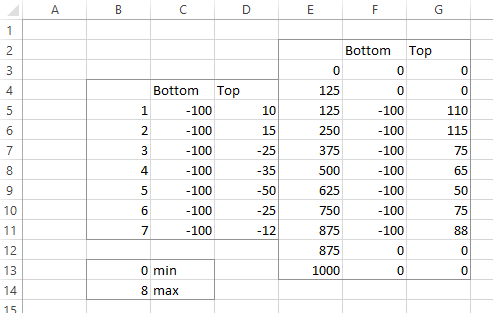 Keep using blank and filled pairs for each additional “Bottom” and “Top” pair of series. How are you getting a logarithmic axis? Are you checking the Logarithmic Axis checkbox in the Format Axis dialog? If so, you don’t need to then use =LOG(whatever) in the data you are plotting. Both primary and secondary series are using the primary Y axis, aren’t they? I see that the first point is messed up, giving you a triangle instead of a rectangle. The vertex of the triangle is at log(1) on the log scale which is zero on a linear scale. What does the data look like? So I got it…I had to create a single merged x (category) value column and repeat y values as needed to span the appropriate x ranges. I am having the same issue as Christoffer. I am trying to add multiple areas of shading. The first area of shading between the bottom curve and the x axis works great! But when I try to add another shading between the bottom curve and the middle curve, something goes wrong when I try and add another area to the secondary axis. Can you help? This is great. I could make the chart so easily. However there is one more thing I would like to do. 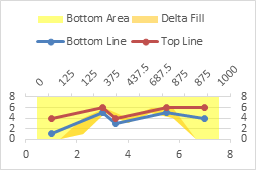 I am presenting sales data of two different regions with the lines. i want the area color to be different when one region is above and different when the other region is up. Is it possible? You could have both colors in different series in the chart. Formulas in the worksheet would evaluate some condition, and make the source data of one or the other zero if certain conditions are met, so only one color appears. then held Ctrl while pressing Enter so it was entered in all the selected cells. I made this chart based off your instructions in the blog ( Thank you!!!!) if you see sometimes the orange line is above green and sometimes below. What I want is that the color of the shaded area changes depending which line is on the top. Is that possible? Can you upload the workbook somewhere I can download it from? Or email it to me (jon at peltiertech dot com). I’ve tried to copy your example “Fill Between Two XY Series”. I use the german version of excel but so far I was able to find all buttons. I only have one problem, which regards the point “draw left to right axes”. When I click on this button (I’ve seen that you produced a picture to show the way and I definitely use the same button”) I can’t find “draw left to right axes”. When I click on it it says something like “show none, show the standard axis, show axis in thousands, show axis in millions, show axis in billions….” Only AFTER I’ve turned the area series into a stacked area diagram I can find your described “draw left to right axes” when i click on the SAME button. But as you have described in your instruction, I have to click on this BEFORE. Do you have a solution for that? Does it make a difference if I choose “XY scatter diagram” or “XY scatter with lines in between”? Microsoft plays with labels in every version of Office, because users weren’t confused enough in the previous version. What you really want here is the standard axis. XY Scatter means show markers for the data points. XY Scatter with Lines means show markers and connect them with lines. Except for the appearance, the chart will behave the same. I’m so close but I just can’t figure out what I’m doing wrong, the shaded area doesn’t line up. I’m trying to show progress versus target of test cases. By date I have the target number of test cases (100%) then 79%, 89% and 97%. I want to shade under 79% red, 80- 89% yellow, 90-97% green and 98-100% white. Then as I fill in the actual test cases it will show the color coding of where we are and the size of any gap. Great tutorial and I’ve enjoyed following the example but I cannot get the last step, i.e. 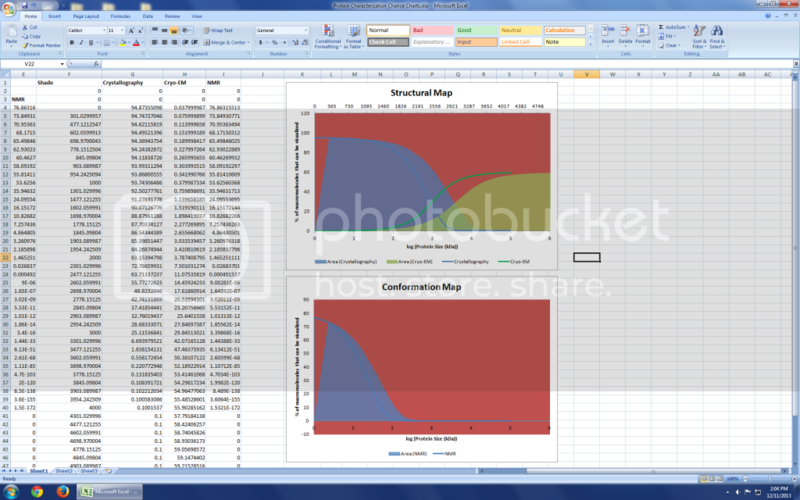 deleting the second horizontal axis to flip the shading under the line in Excel 2003. You mention at the top having made previous versions of this tutorial, would these be more helpful to someone using Excel 2003? Can I find these anywhere? is this possible in Excel 2003? I’m struggling following the example at the very last step to shade beneath a line. When i delete the second horizontal axis the shaded area moves off the left and remains above the line. This technique is certainly possible in 2003, though it takes a bit different sequence of steps. Unfortunately I have not used that version in so long that I don’t remember the older sequence. Thanks so much for a very awesome tutorial. I followed your instructions for creating the XY Scatter diagram and then shading above, below, between. My problem is that I need 3 axes. My two Primary axes are fine, but I can’t seem to get the Secondary Vertical axes that I need (in date format) without messing up the shading. Can you help? I have attempted to give you an image website link to an image of what I have thus far…. What I need is another axes on the right, in date format. Can you help me fix that, please. I am using Excel 2010. Thank you for this awesome tutorial. It has really helped me display the data I have in ways that people understand well. I have run into a tiny snag with the filled in range and I was hoping you could help me trouble shoot. The area chart seems to line up perfectly in the chart except for the beginning of the range where a sliver seems to descend nearly to zero. Let me know if you need a visualization or my data set. Hi Jon. Thanks so much for the excellent work you do. I think my problem is relatively simple, but I can’t quite work it out. Was wondering if you could help? Thanks so much in advance, Patrick. 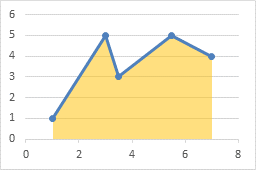 Is it possible to use do x-Axis in date format? 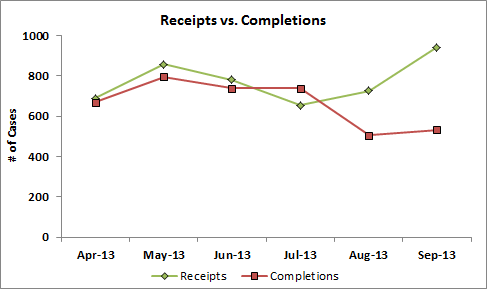 If the X values are dates, this is much easier, since both line charts and area charts can use the same axis. 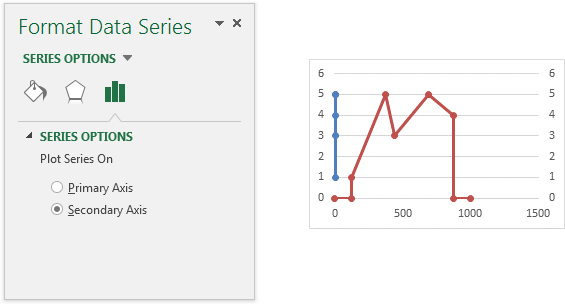 Make a line chart with your first two series, calculate the area chart Y values teh same way as above, but plot them with the same dates as the line chart uses. Great tutorial and feedback on question! Sitting here now with nice shaded graphs :) Cheers! Hi Jon, great tuturials you have on this website. I have to note, that when I try to set the secondary horizontal axis, I cannot mark ‘from left to right’ but there is only an option in that spot that says ‘show normal/ standard axis’. Not sure if this has to do something with it. 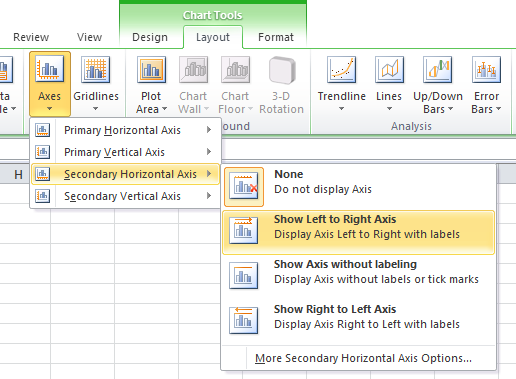 I’m using Excel 2010 and I’ve being battling for hours looking for “finally click Draw Left to Right Axis”. I’ll appreciate your assistance on this. Actually, it’s Show Right to Left Axis, but I’m surprised you didn’t try it even if it didn’t say Draw. 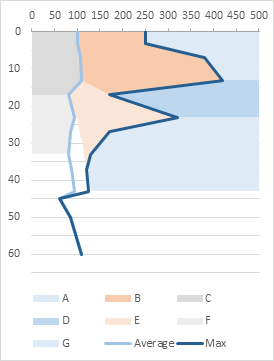 Hi – I have replicated the chart with the shading between the lines but I need to get monthly labels along the horizontal axis is there a way to do this? For those who are interested in vertical bands, say to highlight a given range that is dynamic, I just discovered this can be done with points connected by a line in an XY plot. 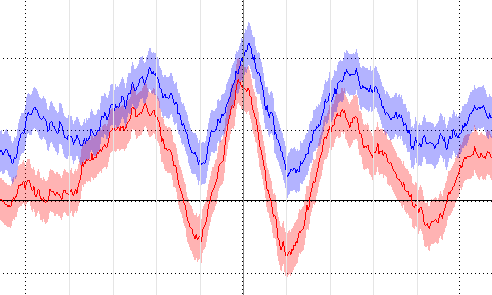 I have several areas within time series data that are determined based on other statistics and I wanted to change the background color behind each section of the time-series. 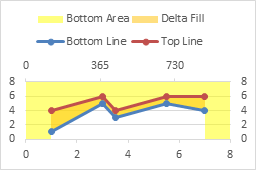 Set these values up as two X points with the same Y value on an XY plot (horizontal) then connect them with a line in the format dialog, remove the marker points, and make sure the ends are set to “square”. Then set the line width to some ridiculously huge number…and, the line between the points fills in the background of the chart. You didn’t say what “doesn’t work” means, exactly. Does the chart not plot the hard-coded data? Do you get errors and the code won’t continue? Is the data formatted exactly as if you manually entered the coded data? 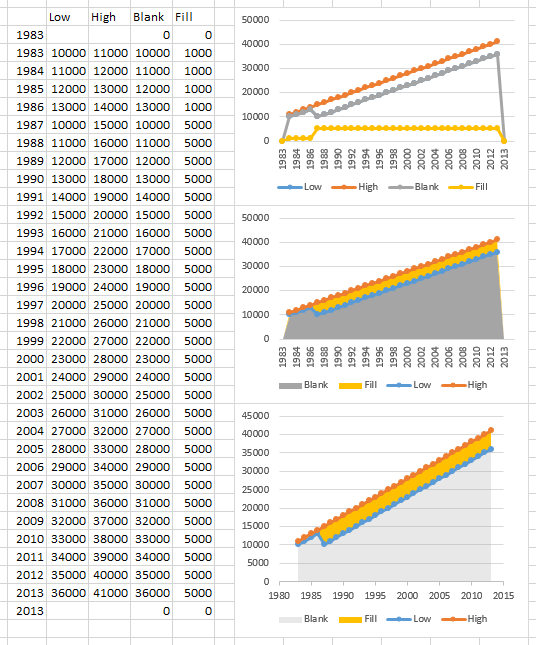 My philosophy is that Excel charts were designed to plot worksheet data, so I almost always put data into the worksheet and plot it, rather than plotting arrays that I’ve built into the series formulas. It sounds like this has worked for you, so I suggest you keep doing it that way. The chart plots fine. What doesn’t work is setting the secondary axis to Date, When I set it to Date within the code, it actually keeps it as a text axis, and therefore doesn’t re-align the secondary axis, so when I delete the axis the fills are not correct. I don’t get any error the visual is just not correct. I can’t have the info in the spreadsheet, because shaded areas will need to be one of ~6 options depending on part of the filename of the file the scatterplot points will coming from. After the code doesn’t change the axis type to date, format the axis: does it have the Date option selected? Can you edit the bounds and units? I had a project that did this with a combination XY-Area chart, and only in Excel 2010 the “Date” axis sometimes did not treat the numbers as dates but as categories. My code would test for this and redraw the whole chart if necessary. It has the Date option selected but there are no bounds to be changed. I am working in Excel 2010. I have been trying to figure this out over the last 8 hours, and I keep redrawing it, but it has yet to ever draw correctly. 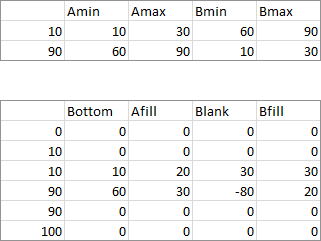 It appear to only draw correctly if the values for the fill areas are in the spreadsheet and not an array. That’s the symptom, it pretends to be a Date scale, but doesn’t allow you to adjust it, and doesn’t treat the values as dates. And it happens with non-worksheet data for the areas. Your code has to put the values into the series formulas anyway, why not put them into the worksheet? I don’t understand this constraint. 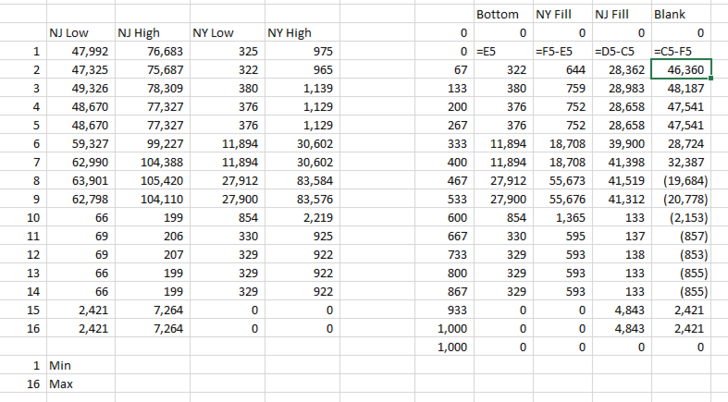 Ideally the data for fill areas (a background in my case split by a slope), would not be in a spreadsheet. The scatter-plot data points that will be plotted on top, is dynamic and is being updated every minute from a peripheral device. So the values for the fill areas will also be dynamic and need to be updated as well. I have it currently set up that the slope and intercept are properties of a class where there are 6 possible instances based on the file being updated by the peripheral device. I think if I absolutely have to I can make it work by placing the data in the spreadsheet..
Isn’t the XY data updating process invoking VBA? That same VBA procedure can update the fill data. the updating isn’t invoking the VBA, I am using a timer to repeat the commands to the peripheral device, once the response is received it is written to the file and then the graph will update based on calling the routine. I can update the fill data that way. That may be my only choice. I am just worried about the visual aspect, I don’t want the fill data visible/editable by the users. You can always hide the data, even in the cells behind the chart. How does the device update the data? Some kind of DDE? I am using a Serial/USB port to communicate with the device. I think I will have to go that route to hide the cells, not my preferred method but if it is the only way. Thank you so much for this tutorial! I was looking for good free/cheap software to make highly customizable elevation profiles for hiking/biking trails, and this worked beautifully. I made a few tweaks to the method, the biggest being that I leave the fill above the chart line, and color it white. That leaves the plot area and grid lines showing under the curve, and gives a lot of options for colors/patterns under the chart line. Thank you for this. I have adapted it to suit an application I’m working on, it seemed to work perfectly at first but the graph is developing an error when certain values are give. I cannot understand why this is happening, can you please help me fix this? I have tried to do twice what’s necessary to do in the example here above given by you but that’s something strange. I can’t post here screenshots. If necessary, I can/want to mail you my document. 1. You can plot the XY data on a logarithmic X axis. The area chart dates must be linear, however, so your formulas in column D would have to have a LOG() transformation to take this into account. 2. Read through the ‘Fill Between Overlapping Regions’ section at the end of the post. Thanks for the fast answer. I’ve tried something, and it’s better. But not yet what it has to be. I’ve a well shaped colored area but that area is not on the right scale & location. The graph with two or more ranges will I try tomorrow. Pieter – Your picture links are not working. I fixed the links, but the pictures are shrunk so small that I can’t read them. 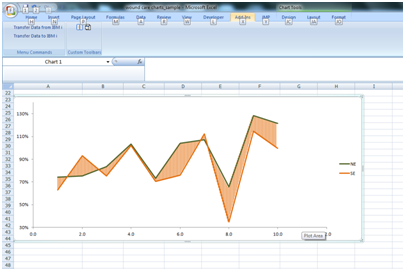 This only works when your horizontal axis of both graphs is actually equal, otherwise excel just ignores your 2nd axis. Excel won’t ignore something that’s there. When you moved some series to the secondary axis, Excel always adds the secondary Y axis, but sometimes it doesn’t add the secondary X axis. If you haven’t explicitly added it, Excel will just keep using the primary axis fire all series. Hi Jon, I am trying to do something similar to your last example. I have six total lines on my graph and I need a shaded area between the first pair, second pair and third. 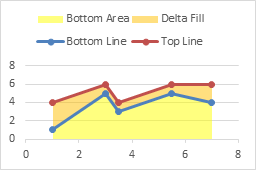 When I only put two lines on the graph and use your method I can get the shaded area between the lines just fine. However, if I try to put them all on the same graph, one of the shaded areas stays between its respective lines, but the others are skewed. I think it has something to do with my secondary x axes, but I’m not completely sure. Any ideas? Say you want to shade between A and B, C and D, and E and F. You need six stacked areas: Value = A with no fill, Value = B – A with color fill 1, Value C – B with no fill, Value D – C with color fill 2, Value E – D with no fill, and Value F – E with color fill 3. Even if there is overlapping, the areas will work correctly, since a negative area will “stack upon” a previous area, going downwards from the previous values. This is great, but I can’t seem to get it to work with multiple shaded areas (I am trying 2 shaded areas). I assume I am not setting up all of the formulas correctly based on my interpretation of the instructions at the end of your post. There is some overlap between the two shaded areas, similar to your example at the end. Col L: Blank formula [I assume this is wrong] (0, =C5-F5, =C6-F6, etc.). Any help would be most appreciated. I have been trying different options for 2 hours and can’t get it. It seems that my secondary Y axis is not scaling properly because it goes to a much larger # than my primary Y axis, which is different than the single shaded region example. Put Blank between Group 2 Fill and Group 1 Fill. The order of area series should be Bottom (formatted with no fill), Group 1 Fill ( with one color) Blank (also no fill), and Group 2 Fill (another color). Also, delete the secondary Y axis, and all series will be plotted against the primary axis. First i appreciate your efforts. I am facing problem that i am following your step in post but unable to see secondary Axis under the Axes tab. Blue marked is my first area which consits out of four single areas. Red marked is another analog area which i pasted via option: “new data point”. The result is the whole – for example orange – area act like one connected area but i would like to give different colours to the orange blue and red marked area parts. 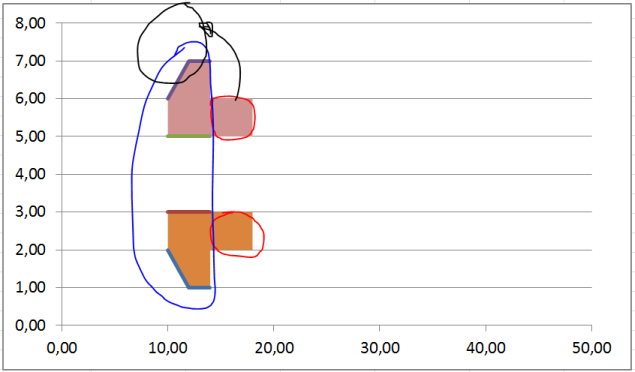 when i paste the red marked additional area data like i pasted the blue marked area – which means by chosing the option “new data row” – it doesnt gets a new orientation in relation to the x-axis. Instead of appearing again in the position like the red marked area it suddenly apears in the black marked position. I hope my description isn’t too confusing. It would help to see the data. However, if you use paste special and add the data as new data points, Excel will try to add the new data to extend the existing series in the chart. This is what happened in your chart. If you use paste special and add the data as new series, it will not extend existing series, but it will add new series, in parallel with the existing series, which is what you want and which is what the tutorial directs you to do. Fantastic tutorial. This is exactly what I needed to do. Just one word of caution. When I switched the secondary axis to a “date axis”, I had some minor alignment problems. I eventually found that if I changed the Units Base to “Days” everything aligns perfectly. For some reason my graph was defaulting to “Months”. I hope this saves someone a little headache. Good point. I make that adjustment automatically (when the characteristics of the data don’t do it by default), so I forgot to mention it. It is really helpful and easy to apply. I have a question regarding adding a new series of data to Fill Between 3 Overlapping Regions. In your post, you explained a case of Fill Between 2 Overlapping Regions. I have tried the same steps that you mention and add “Cfill and Blank2” columns to the previous calculations. But I am not sure if it is correct and if we really need another blank how it should be calculated. Thank you once again. I really appreciate your help. I would suggest trying it yourself with the same data I used here, then when it feels familiar, try it with your own data. If you still have problems with your own data, upload it to a file-sharing website, and comment back with a link. Is it possible to do something similar with a radar graph instead of an XY plot? Actually, a radar chart can have both filled series (like an area chart) and line or line-and-marker series (like a line chart). Unfortunately a big in Excel adds a false category in a mixed-type radar chart. Note the six-spoke line-and-marker radar chart gains an unlabeled seventh spoke between F and A when one series is converted to a filled type. In an interesting twist, moving one series (doesn’t matter which one) to the secondary axis restores the correct number of spokes, while shrinking the plot area (which can then be stretched). I’m not a fan of radar charts anyway. 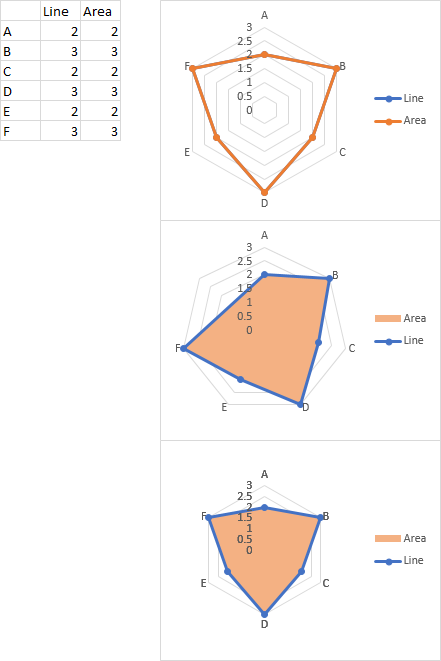 I only discovered this bug when I created a radar chart to show that you can make a combination filled and line-and-marker version. As a follow -up, I’ve copied the data for the 2 charts beneath each other. Basically, I am attempting to replicate a conversion funnel. It’s almost there.. just slight misalignment of the scatter plot and area chart along the X axis. Are you able to make these data points work? 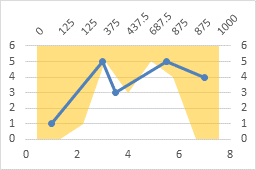 Aside from any discussion about sales funnels (which I don’t like, see Sales “Funnels”, Funnel (Tornado) Chart, Bad Graphics – Funnel Chart), there is a problem with your date scale. But even when I use your original figures (positive and negative dates), as long as I make sure the scatter X axis ranges from the numbers I use to calculate the area chart X values (+/-35MM), the plot is perfectly aligned.